Byers, Edward Jr. C. Carpenter, William Kyle Carter, Ty M. Giunta, Salvatore A. Groberg, Florent A. Meyer, Dakota Miller, Robert J. Monti, Jared C. Murphy, Michael P. Pitts, Ryan M. Petry, Leroy A. Romesha, Clinton L. Swenson, William D. White, Kyle J.
Citation: For conspicuous gallantry and intrepidity at the risk of his life above and beyond the call of duty as a Hostage Rescue Force Team Member in Afghanistan in support of Operation ENDURING FREEDOM from 8 to 9 December 2012. As the rescue force approached the target building, an enemy sentry detected them and darted inside to alert his fellow captors. The sentry quickly reemerged, and the lead assaulter attempted to neutralize him. Chief Byers with his team sprinted to the door of the target building. As the primary breacher, Chief Byers stood in the doorway fully exposed to enemy fire while ripping down six layers of heavy blankets fastened to the inside ceiling and walls to clear a path for the rescue force. The first assaulter pushed his way through the blankets, and was mortally wounded by enemy small arms fire from within. Chief Byers, completely aware of the imminent threat, fearlessly rushed into the room and engaged an enemy guard aiming an AK- 47 at him. He then tackled another adult male who had darted towards the corner of the room. During the ensuing hand-to-hand struggle, Chief Byers confirmed the man was not the hostage and engaged him. As other rescue team members called out to the hostage, Chief Byers heard a voice respond in English and raced toward it. He jumped atop the American hostage and shielded him from the high volume of fire within the small room. While covering the hostage with his body, Chief Byers immobilized another guard with his bare hands, and restrained the guard until a teammate could eliminate him. His bold and decisive actions under fire saved the lives of the hostage and several of his teammates. By his undaunted courage, intrepid fighting spirit, and unwavering devotion to duty in the face of near certain death, Chief Petty Officer Byers reflected great credit upon himself and upheld the highest traditions of the United States Naval Service. Citation: For conspicuous gallantry and intrepidity at the risk of his life above and beyond the call of duty: Specialist Ty M. Carter distinguished himself by acts of gallantry and intrepidity at the risk of his life above and beyond the call of duty while serving as a Scout with Bravo Troop, 3d Squadron, 61st Cavalry Regiment, 4th Brigade Combat Team, 4th Infantry Division, during combat operations against an armed enemy in Kamdesh District, Nuristan Province, Afghanistan on October 3, 2009. On that morning, Specialist Carter and his comrades awakened to an attack of an estimated 300 enemy fighters occupying the high ground on all four sides of Combat Outpost Keating, employing concentrated fire from recoilless rifles, rocket propelled grenades, anti-aircraft machine guns, mortars and small arms fire. Specialist Carter reinforced a forward battle position, ran twice through a 100 meter gauntlet of enemy fire to resupply ammunition and voluntarily remained there to defend the isolated position. Armed with only an M4 carbine rifle, Specialist Carter placed accurate, deadly fire on the enemy, beating back the assault force and preventing the position from being overrun, over the course of several hours. With complete disregard for his own safety and in spite of his own wounds, he ran through a hail of enemy rocket propelled grenade and machine gun fire to rescue a critically wounded comrade who had been pinned down in an exposed position. Specialist Carter rendered life extending first aid and carried the Soldier to cover. On his own initiative, Specialist Carter again maneuvered through enemy fire to check on a fallen Soldier and recovered the squad's radio, which allowed them to coordinate their evacuation with fellow Soldiers. With teammates providing covering fire, Specialist Carter assisted in moving the wounded Soldier 100 meters through withering enemy fire to the aid station and before returning to the fight. Specialist Carter's heroic actions and tactical skill were critical to the defense of Combat Outpost Keating, preventing the enemy from capturing the position and saving the lives of his fellow Soldiers. Specialist Ty M. Carter's extraordinary heroism and selflessness above and beyond the call of duty are in keeping with the highest traditions of military service and reflect great credit upon himself, Bravo Troop, 3d Squadron, 61st Cavalry Regiment, 4th Brigade Combat Team, 4th Infantry Division and the United States Army. Citation: Specialist Salvatore A. Giunta distinguished himself conspicuously by gallantry and intrepidity at the risk of his life above and beyond the call of duty in action with an armed enemy in the Korengal Valley, Afghanistan, on October 25, 2007. While conducting a patrol as team leader with Company B, 2d Battalion (Airborne), 503d Infantry Regiment, Specialist Giunta and his team were navigating through harsh terrain when they were ambushed by a well-armed and well-coordinated insurgent force. While under heavy enemy fire, Specialist Giunta immediately sprinted towards cover and engaged the enemy. Seeing that his squad leader had fallen and believing that he had been injured, Specialist Giunta exposed himself to withering enemy fire and raced towards his squad leader, helped him to cover, and administered medical aid. While administering first aid, enemy fire struck Specialist Giunta's body armor and his secondary weapon. Without regard to the ongoing fire, Specialist Giunta engaged the enemy before prepping and throwing grenades, using the explosions for cover in order to conceal his position. Attempting to reach additional wounded fellow soldiers who were separated from the squad, Specialist Giunta and his team encountered a barrage of enemy fire that forced them to the ground. The team continued forward and upon reaching the wounded soldiers, Specialist Giunta realized that another soldier was still separated from the element. Specialist Giunta then advanced forward on his own initiative. As he crested the top of a hill, he observed two insurgents carrying away an American soldier. He immediately engaged the enemy, killing one and wounding the other. Upon reaching the wounded soldier, he began to provide medical aid, as his squad caught up and provided security. 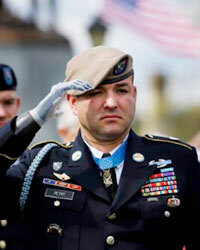 Specialist Giunta's unwavering courage, selflessness, and decisive leadership while under extreme enemy fire were integral to his platoon's ability to defeat an enemy ambush and recover a fellow American soldier from the enemy. Specialist Salvatore A. Giunta's extraordinary heroism and selflessness above and beyond the call of duty are in keeping with the highest traditions of military service and reflect great credit upon himself, Company B, 2d Battalion (Airborne), 503d Infantry Regiment, and the United States Army. 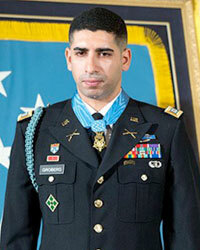 Citation: Captain Florent A. Groberg distinguished himself by acts of gallantry and intrepidity at the risk of his life above and beyond the call of duty while serving as a personal security detachment commander for Task Force Mountain Warrior, Fourth Infantry Brigade Combat Team, Fourth Infantry Division during combat operations against an armed enemy in Asadabad, Kunar Province, Afghanistan, on August 8, 2012. On that day, Captain Groberg was leading a dismounted movement consisting of several senior leaders to include two brigade commanders, two battalion commanders, two command sergeants major, and an Afghanistan National Army brigade commander. As they approached the provincial governor’s compound, Captain Groberg observed an individual walking close to the formation. While the individual made an abrupt turn towards the formation, he noticed an abnormal bulge underneath the individual’s clothing. Selflessly placing himself in front of one of the brigade commanders, Captain Groberg rushed forward using his body to push the suspect away from the formation. Simultaneously, he ordered another member of the security detail to assist with removing the suspect. At this time, Captain Groberg confirmed the bulge was a suicide vest. And with complete disregard for this life, Captain Groberg, again, with the assistance of the other member of the security detail, physically pushed the suicide bomber away from the formation. Upon falling, the suicide bomber detonated his explosive vest outside of the perimeter of the formation, killing four members of the formation and wounding numerous others. The blast from the first suicide bomb caused the suicide vest of a previously unnoticed second suicide bomber to detonate prematurely with minimal impact on the formation. Captain Groberg’s immediate actions to push the first suicide bomber away from the formation significantly minimized the impact of the coordinated suicide bombers’ attack on the formation, saving the lives of his comrades and several senior leaders. Captain Groberg’s extraordinary heroism and selflessness above and beyond the call of duty at the risk of his life on keeping with the highest traditions of the military service, and reflect great credit upon himself, Fourth Infantry Brigade Combat Team, Fourth Infantry Division, and the United States Army. Citation: Corporal Meyer maintained security at a patrol rally point while other members of his team moved on foot with two platoons of Afghan National Army and Border Police into the village of Ganjgal for a pre-dawn meeting with village elders. Moving into the village, the patrol was ambushed by more than 50 enemy fighters firing rocket propelled grenades, mortars, and machine guns from houses and fortified positions on the slopes above. Hearing over the radio that four U.S. team members were cut off, Corporal Meyer seized the initiative. With a fellow Marine driving, Corporal Meyer took the exposed gunner's position in a gun-truck as they drove down the steeply terraced terrain in a daring attempt to disrupt the enemy attack and locate the trapped U.S. team. Disregarding intense enemy fire now concentrated on their lone vehicle, Corporal Meyer killed a number of enemy fighters with the mounted machine guns and his rifle, some at near point blank range, as he and his driver made three solo trips into the ambush area. 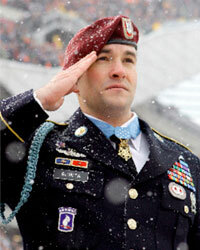 During the first two trips, he and his driver evacuated two dozen Afghan soldiers, many of whom were wounded. 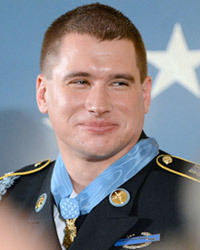 When one machine gun became inoperable, he directed a return to the rally point to switch to another gun-truck for a third trip into the ambush area where his accurate fire directly supported the remaining U.S. personnel and Afghan soldiers fighting their way out of the ambush. Despite a shrapnel wound to his arm, Corporal Meyer made two more trips into the ambush area in a third gun-truck accompanied by four other Afghan vehicles to recover more wounded Afghan soldiers and search for the missing U.S. team members. 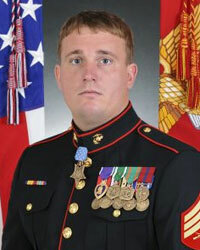 Still under heavy enemy fire, he dismounted the vehicle on the fifth trip and moved on foot to locate and recover the bodies of his team members. Corporal Meyer's daring initiative and bold fighting spirit throughout the 6-hour battle significantly disrupted the enemy's attack and inspired the members of the combined force to fight on. His unwavering courage and steadfast devotion to his U.S. and Afghan comrades in the face of almost certain death reflected great credit upon himself and upheld the highest traditions of the Marine Corps and the United States Naval Service. 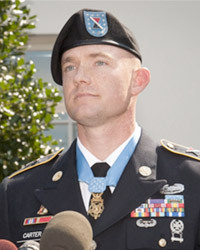 Citation: Robert J. Miller distinguished himself by extraordinary acts of heroism while serving as the Weapons Sergeant in Special Forces Operational Detachment Alpha 3312, Special Operations Task Force-33, Combined Joint Special Operations Task Force-Afghanistan during combat operations against an armed enemy in Konar Province, Afghanistan on January 25, 2008. While conducting a combat reconnaissance patrol through the Gowardesh Valley, Staff Sergeant Miller and his small element of U.S. and Afghan National Army soldiers engaged a force of 15 to 20 insurgents occupying prepared fighting positions. Staff Sergeant Miller initiated the assault by engaging the enemy positions with his vehicle's turret-mounted Mark-19 40 millimeter automatic grenade launcher while simultaneously providing detailed descriptions of the enemy positions to his command, enabling effective, accurate close air support. Following the engagement, Staff Sergeant Miller led a small squad forward to conduct a battle damage assessment. As the group neared the small, steep, narrow valley that the enemy had inhabited, a large, well-coordinated insurgent force initiated a near ambush, assaulting from elevated positions with ample cover. Exposed and with little available cover, the patrol was totally vulnerable to enemy rocket propelled grenades and automatic weapon fire. As point man, Staff Sergeant Miller was at the front of the patrol, cut off from supporting elements, and less than 20 meters from enemy forces. Nonetheless, with total disregard for his own safety, he called for his men to quickly move back to covered positions as he charged the enemy over exposed ground and under overwhelming enemy fire in order to provide protective fire for his team. While maneuvering to engage the enemy, Staff Sergeant Miller was shot in his upper torso. Ignoring the wound, he continued to push the fight, moving to draw fire from over one hundred enemy fighters upon himself. He then again charged forward through an open area in order to allow his teammates to safely reach cover. After killing at least 10 insurgents, wounding dozens more, and repeatedly exposing himself to withering enemy fire while moving from position to position, Staff Sergeant Miller was mortally wounded by enemy fire. His extraordinary valor ultimately saved the lives of seven members of his own team and 15 Afghanistan National Army soldiers. 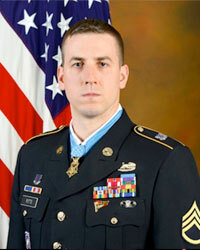 Staff Sergeant Miller's heroism and selflessness above and beyond the call of duty, and at the cost of his own life, are in keeping with the highest traditions of military service and reflect great credit upon himself and the United States Army. Citation: Staff Sergeant Jared C. Monti distinguished himself by acts of gallantry and intrepidity above and beyond the call of duty while serving as a team leader with Headquarters and Headquarters Troop, 3d Squadron, 71st Cavalry Regiment, 3d Brigade Combat Team, 10th Mountain Division, in connection with combat operations against an armed enemy in Nuristan Province, Afghanistan, on June 21, 2006. While Staff Sergeant Monti was leading a mission aimed at gathering intelligence and directing fire against the enemy, his 16-man patrol was attacked by as many as 50 enemy fighters. On the verge of being overrun, Staff Sergeant Monti quickly directed his men to set up a defensive position behind a rock formation. He then called for indirect fire support, accurately targeting the rounds upon the enemy who had closed to within 50 meters of his position. While still directing fire, Staff Sergeant Monti personally engaged the enemy with his rifle and a grenade, successfully disrupting an attempt to flank his patrol. Staff Sergeant Monti then realized that one of his Soldiers was lying wounded in the open ground between the advancing enemy and the patrol's position. With complete disregard for his own safety, Staff Sergeant Monti twice attempted to move from behind the cover of the rocks into the face of relentless enemy fire to rescue his fallen comrade. Determined not to leave his Soldier, Staff Sergeant Monti made a third attempt to cross open terrain through intense enemy fire. On this final attempt, he was mortally wounded, sacrificing his own life in an effort to save his fellow Soldier. Staff Sergeant Monti's selfless acts of heroism inspired his patrol to fight off the larger enemy force. Staff Sergeant Monti's immeasurable courage and uncommon valor are in keeping with the highest traditions of military service and reflect great credit upon himself, Headquarters and Headquarters Troop, 3d Squadron, 71st Cavalry Regiment, 3d Brigade Combat Team, 10th Mountain Division, and the United States Army. Citation: For conspicuous gallantry and intrepidity at the risk of his life above and beyond the call of duty as the leader of a special reconnaissance element with Naval Special Warfare Task Unit Afghanistan on 27 and 28 June 2005. While leading a mission to locate a high-level anti-coalition militia leader, Lieutenant Murphy demonstrated extraordinary heroism in the face of grave danger in the vicinity of Asadabad, Konar Province, Afghanistan. On 28 June 2005, operating in an extremely rugged enemy-controlled area, Lieutenant Murphy's team was discovered by anti-coalition militia sympathizers, who revealed their position to Taliban fighters. As a result, between 30 and 40 enemy fighters besieged his four-member team. Demonstrating exceptional resolve, Lieutenant Murphy valiantly led his men in engaging the large enemy force. The ensuing fierce firefight resulted in numerous enemy casualties, as well as the wounding of all four members of the team. Ignoring his own wounds and demonstrating exceptional composure, Lieutenant Murphy continued to lead and encourage his men. When the primary communicator fell mortally wounded, Lieutenant Murphy repeatedly attempted to call for assistance for his beleaguered teammates. Realizing the impossibility of communicating in the extreme terrain, and in the face of almost certain death, he fought his way into open terrain to gain a better position to transmit a call. This deliberate, heroic act deprived him of cover, exposing him to direct enemy fire. Finally achieving contact with his Headquarters, Lieutenant Murphy maintained his exposed position while he provided his location and requested immediate support for his team. In his final act of bravery, he continued to engage the enemy until he was mortally wounded, gallantly giving his life for his country and for the cause of freedom. 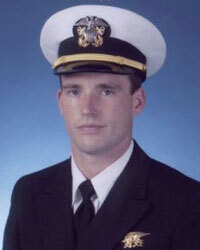 By his selfless leadership, courageous actions, and extraordinary devotion to duty, Lieutenant Murphy reflected great credit upon himself and upheld the highest traditions of the United States Naval Service. Citation: For conspicuous gallantry and intrepidity at the risk of his life above and beyond the call of duty: Staff Sergeant Leroy A. Petry distinguished himself by acts of gallantry and intrepidity at the risk of his life above and beyond the call of duty in action with an armed enemy in the vicinity of Paktya Province, Afghanistan, on May 26, 2008. As a Weapons Squad Leader with D Company, 2nd Battalion, 75th Ranger Regiment, Staff Sergeant Petry moved to clear the courtyard of a house that potentially contained high-value combatants. While crossing the courtyard, Staff Sergeant Petry and another Ranger were engaged and wounded by automatic weapons fire from enemy fighters. 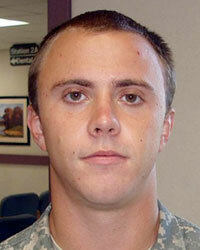 Still under enemy fire, and wounded in both legs, Staff Sergeant Petry led the other Ranger to cover. He then reported the situation and engaged the enemy with a hand grenade, providing suppression as another Ranger moved to his position. The enemy quickly responded by maneuvering closer and throwing grenades. 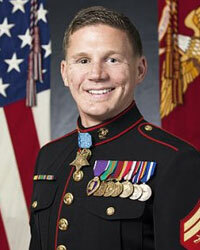 The first grenade explosion knocked his two fellow Rangers to the ground and wounded both with shrapnel. A second grenade then landed only a few feet away from them. Instantly realizing the danger, Staff Sergeant Petry, unhesitatingly and with complete disregard for his safety, deliberately and selflessly moved forward, picked up the grenade, and in an effort to clear the immediate threat, threw the grenade away from his fellow Rangers. As he was releasing the grenade it detonated, amputating his right hand at the wrist and further injuring him with multiple shrapnel wounds. Although picking up and throwing the live grenade grievously wounded Staff Sergeant Petry, his gallant act undeniably saved his fellow Rangers from being severely wounded or killed. Despite the severity of his wounds, Staff Sergeant Petry continued to maintain the presence of mind to place a tourniquet on his right wrist before communicating the situation by radio in order to coordinate support for himself and his fellow wounded Rangers. Staff Sergeant Petry's extraordinary heroism and devotion to duty are in keeping with the highest traditions of military service, and reflect great credit upon himself, 75th Ranger Regiment, and the United States Army. Citation: For conspicuous gallantry and intrepidity in action at the risk of his life above and beyond the call of duty while serving as a Section Leader with Bravo Troop, 3d Squadron, 61st Cavalry Regiment, 4th Brigade Combat Team, 4th Infantry Division, during combat operations against an armed enemy at Combat Outpost Keating, Kamdesh District, Nuristan Province, Afghanistan on 3 October 2009. On that morning, Staff Sergeant Romesha and his comrades awakened to an attack by an estimated 300 enemy fighters occupying the high ground on all four sides of the complex, employing concentrated fire from recoilless rifles, rocket propelled grenades, anti-aircraft machine guns, mortars and small arms fire. Staff Sergeant Romesha moved uncovered under intense enemy fire to conduct a reconnaissance of the battlefield and seek reinforcements from the barracks before returning to action with the support of an assistant gunner. Staff Sergeant Romesha took out an enemy machine gun team and, while engaging a second, the generator he was using for cover was struck by a rocket-propelled grenade, inflicting him with shrapnel wounds. Undeterred by his injuries, Staff Sergeant Romesha continued to fight and upon the arrival of another soldier to aid him and the assistant gunner, he again rushed through the exposed avenue to assemble additional soldiers. 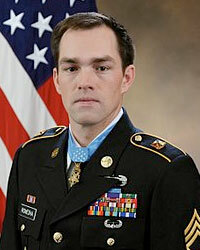 Staff Sergeant Romesha then mobilized a five-man team and returned to the fight equipped with a sniper rifle. With complete disregard for his own safety, Staff Sergeant Romesha continually exposed himself to heavy enemy fire, as he moved confidently about the battlefield engaging and destroying multiple enemy targets, including three Taliban fighters who had breached the combat outpost's perimeter. While orchestrating a successful plan to secure and reinforce key points of the battlefield, Staff Sergeant Romesha maintained radio communication with the tactical operations center. As the enemy forces attacked with even greater ferocity, unleashing a barrage of rocket-propelled grenades and recoilless rifle rounds, Staff Sergeant Romesha identified the point of attack and directed air support to destroy over 30 enemy fighters. After receiving reports that seriously injured soldiers were at a distant battle position, Staff Sergeant Romesha and his team provided covering fire to allow the injured soldiers to safely reach the aid station. Upon receipt of orders to proceed to the next objective, his team pushed forward 100 meters under overwhelming enemy fire to recover and prevent the enemy fighters from taking the bodies of the fallen comrades. Staff Sergeant Romesha's heroic actions throughout the day-long battle were critical in suppressing an enemy that had far greater numbers. His extraordinary efforts gave Bravo Troop the opportunity to regroup, reorganize and prepare for the counterattack that allowed the Troop to account for its personnel and secure Combat Post Keating. Staff Sergeant Romesha's discipline and extraordinary heroism above and beyond the call of duty reflect great credit upon himself, Bravo Troop, 3d Squadron, 61st Cavalry Regiment, 4th Brigade Combat Team, 4th Infantry Division and the United States Army. 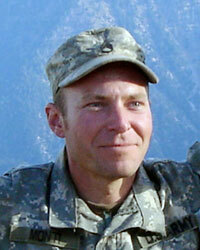 Captain William D. Swenson distinguished himself by acts of gallantry and intrepidity at the risk of his life above and beyond the call of duty while serving as embedded advisor to the Afghan National Border Police, Task Force Phoenix, Combined Security Transition Command-Afghanistan in support of 1st Battalion, 32nd Infantry Regiment, 3d Brigade Combat Team, 10th Mountain Division, during combat operations against an armed enemy in Kunar Province, Afghanistan on September 8, 2009. On that morning, more than 60 well-armed, well-positioned enemy fighters ambushed Captain Swenson's combat team as it moved on foot into the village of Ganjgal for a meeting with village elders. As the enemy unleashed a barrage of rocket-propelled grenade, mortar and machine gun fire, Captain Swenson immediately returned fire and coordinated and directed the response of his Afghan Border Police, while simultaneously calling in suppressive artillery fire and aviation support. After the enemy effectively flanked Coalition Forces, Captain Swenson repeatedly called for smoke to cover the withdrawal of the forward elements. Surrounded on three sides by enemy forces inflicting effective and accurate fire, Captain Swenson coordinated air assets, indirect fire support and medical evacuation helicopter support to allow for the evacuation of the wounded. Captain Swenson ignored enemy radio transmissions demanding surrender and maneuvered uncovered to render medical aid to a wounded fellow soldier. Captain Swenson stopped administering aid long enough to throw a grenade at approaching enemy forces, before assisting with moving the soldier for air evacuation. With complete disregard for his own safety, Captain Swenson unhesitatingly led a team in an unarmored vehicle into the kill zone, exposing himself to enemy fire on at least two occasions, to recover the wounded and search for four missing comrades. After using aviation support to mark locations of fallen and wounded comrades, it became clear that ground recovery of the fallen was required due to heavy enemy fire on helicopter landing zones. Captain Swenson's team returned to the kill zone another time in a Humvee. 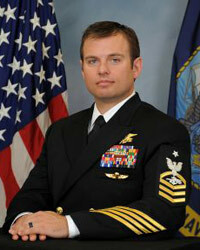 Captain Swenson voluntarily exited the vehicle, exposing himself to enemy fire, to locate and recover three fallen Marines and one fallen Navy corpsman. His exceptional leadership and stout resistance against the enemy during six hours of continuous fighting rallied his teammates and effectively disrupted the enemy's assault. Captain William D. Swenson's extraordinary heroism and selflessness above and beyond the call of duty are in keeping with the highest traditions of military service and reflect great credit upon himself, Task Force Phoenix, 1st Battalion, 32nd Infantry Regiment, 3d Brigade Combat Team, 10th Mountain Division and the United States Army.